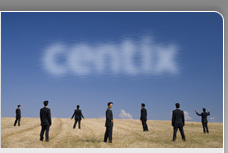 We at Centix believe that focus is key to quality. Instead of offering a broad range of all-round IT services, we have chosen to be an expert in a limited scope of services. But within this focus, we are the best! Wilfried Baeten is managing partner and co-founder of Centix; he is responsible for the General Management of Centix and for the Sales&Marketing activities; Wilfried started his career as Project Manager at Callataÿ & Wouters, after which he joined Deloitte (formerly Andersen) to become Manager in their SAP practice. As a Solutions Director at Porthus, Wilfried became responsible for the IT Architects team, including responsibilities such as Product Development, Presales & Bid Management, IT Project Architecture and Technical Account Management. In 2006, he became an independent consultant in CIO Services, resulting in amongst others an assignment as ICT Manager of a large international company founded in Flanders. Wilfried holds a Master degree in Civil Engineering and an Executive Master in Business Administration from the University of Leuven. Kris Van Opstaele is managing partner and co-founder of Centix; he is responsible for HR & Operations Management and he leads the Citrix Practice; Kris started his career at Deloitte (formerly Andersen, formerly Arthur Andersen), where he became Senior Consultant covering IT and Security audits. Given his background, he joined Porthus (formerly EurASP) in 2001 as a Security Manager. Over the years, he evolved to a Senior IT architect, mainly covering Server Based Computing and Application Delivery projects. In this context, Kris was appointed as team leader of the Citrix consultancy department at Porthus. Kris holds a Master degree in Computer Science from the University of Ghent and a Master of European Business from EHSAL. Erik De Nert is managing partner and co-founder of Centix; he is responsible for the Finance & Administration activities and he leads the VMware Practice; Erik started his career at Merck as Systems Manager, where Erik was responsible for both the internal Citrix farm as well as the Active Directory infrastructure and architecture. In 2005, he joined Porthus as IT Architect, and became responsible for the design and project management of some of the largest Citrix implementations in Belgium. Erik holds a Master degree in Computer Science from the University of Ghent.